The Sterilucent™ PSD-85 Hydrogen Peroxide Sterilizer System (PSD-85) brings a comprehensive low-temperature sterilization solution to providers that are tasked with the delivery of health care in austere environments such as combat support hospitals, refugee camps or remote locations with limited resources. The PSD-85 has a low energy demand with rapid sterilization cycles, compatibility to low-temperature and moisture-sensitive devices and is designed to withstand transportation and harsh environmental conditions. The PSD-85 is easy to set up and operate. 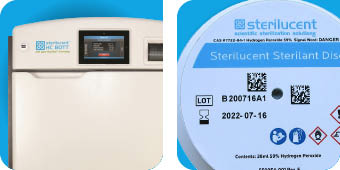 Sterilucent, also offers a full line of accessories to assure the quality of the device sterilization process and provide protection for your patients and surgical instrument inventory.